Over 30,000 words, with clear and accessible meanings and age-appropriate example sentences, make this an ideal dictionary for helping children aged 8+ with homework. Each letter opens with a fun word fact and there are colour illustrations throughout. For example, did you know that 'almost' is one of the longest words with all the letters in alphabetical order? 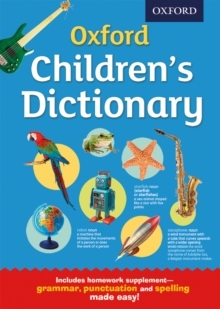 Compiled using the Oxford Children's Corpus, this new edition of the Oxford Children's Dictionarydelivers support and help where it is needed. New to this edition is a supplement that gives top things to know about spelling, as well as about punctuation marks and how grammar can help make writing easy and effective.